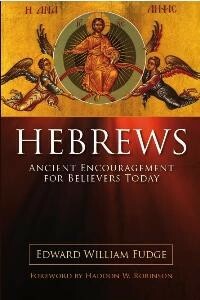 I’ve just finished reading an advance copy of Hebrews: Ancient Encouragement for Believers Today, by Edward Fudge. Anyway, Edward is an elder, lawyer, and theological author working at the highest levels. He wrote The Fire that Consumes, which remains the classic treatment of conditionalism, being cited by scholars from all denominations and traditions whenever the topic is broached. In his GracEmails, Edwards demonstrates his rare gift for stating profound truths in gems of remarkable simplicity and conciseness (I am painfully jealous). His commentary on Hebrews is written with the same elegance. In fact, it’s a bit deceptive, as he speaks so directly and simply that at first you don’t realize how much depth is being provided. Linger over every word. The style is popular, with few references to Greek syntax and such. The book has no footnotes or endnotes, and minimizes references to the work of other non-biblical authors. However, it’s clear the book reflects serious research into the latest studies. Thus, Edward refers to the book as a “bridge commentary,” that is, a commentary of serious scholarship written in a style that’s transparent to the novice learner. The first known writing identifying Paul as author of Hebrews is Papyrus 46 (or P46) written about a.d. 200 and found in Egypt. However, church leaders a century later still didn’t know who wrote Hebrews. Clement of Alexandria surmised that Paul wrote Hebrews in Hebrew and that Luke translated it into Greek. (Of course no one has ever found a Hebrew Hebrews, so Clement stands by himself with that idea.) Origen was less sure, confessing that “who really wrote the letter is known to God alone.” Elsewhere in Africa, at Carthage, Tertullian nominated Barnabas as the author of Hebrews. Most Christians in the Roman West said they didn’t know. Centuries later, in the Reformation, Luther leaned toward Apollos while Calvin favored Luke or a second-century believer named Clement of Rome. The commentary on Hebrews by F. F. Bruce in the New International Commentary series expends nearly eight pages on the question, and yet says little more. To go to the place of no more sacrifice, one does not have to intellectually forsake every element of Christian understanding piece by piece until nothing remains. Nor is it necessary that someone stand before the public and specifically renounce Jesus Christ and all that he has done. A person can fall to the place of no more sacrifice while supposing that he or she is a genuine believer. This is a practical apostasy, not necessarily an intellectual one. As such, it allows the greatest room for self-deception. It can occur in more ways than one. • It can happen when someone listens to God speak through the Son, professes to believe God’s promises, claims to rely on Jesus Christ and his sacrifice for sin, attends public meetings with other believers—but steadfastly continues to practice sin and immorality as a chosen and regular way of life. • It can happen when someone listens, professes, claims and attends as just described, and even demonstrates a somewhat transformed life—but one day decides it isn’t worth the effort, packs away the Bible, stops meeting with believers, quits praying, puts Jesus out of mind and, from that point forward, lives as if Jesus did not exist and if this present life were the final stop. I’ve just read the comments on the same passage in the Sweet, the New International, and the Tyndale commentaries. There is no comparison. Edward’s comments cut to the heart of the passage and tell us what we need to hear. The others either explain the passage away or treat it with such intellectualism that the passage is stripped of its real and present fearsomeness.